Permit me dear reader to say nothing about the farce unfolding in Athens presently, except perhaps to comment that when an economy unravels its political regime follows. Today’s post concerns a TV debate in which I participated yesterday. It was hosted by the French global channel France24 and featured two French economists, myself and a colleague from Germany. I suggest you watch it for one reason alone: It captures nicely Europe’s conundrum. On the one hand, there is an anxiety to make Europe work by diagnosing its condition correctly and putting in place new institutions that will not only offer palliatives but, more importantly, also undo the underlying causes of the crisis. On the other side we have a Protestant pastor-like figure talking about guilt, punishment and the fires of hell that must consume the damned. A frustrating but, at once, enlightening experience. Any comments? Click here to watch Part A and here to watch Part B.
I thought I watched you on Al Jazeera last night and it was a very interesting discussion. Perhaps I have mistaken you for someone else. It was me, I am afraid! In the same time, politicians aren´t commenting a lot about this topic. They are all caught in the politics game. Because of the situation that the ruling coalition is loosing ground on a very high pace, and the oppositon is willing to overtake, it´s not going to change any time soon. We call it here “the first one who moves (in this case the first one to speak for or against Greece), will loose”. On the economists level, it´s a split race. It´s a theoretical battle, but in the media it´s biased. But! When you check the official opinon of the advisors to the chancelor, with only one “Socialist” on the board, you will notice that they absolutely disagree with Prof. Dr. Markus C. Kerber. The same opinion (helping Greece) is also common under the pro EU(RO) younger population. Unlike under the older Population wich it´s still (relatively) hostile to the EURO and nostalgic to the DM. Well, as you say German thinking on the subject is mixed and also very confused thanks to relentless media brain-washing — to put it mildly. I think Mister Kerber is representative at least for the vast majority of German academic economists. The mass petition signed 189 academic economists clearly indicates their stance. But I was also encouraged reading the comment section to an opinion piece by our new BuBa chieftain Weidmann in Süddeutsche Zeitung. He made the absurd claims that (a) the Euro is a huge success (b) it doesn’t matter at all if Greece exits the Euro and (c) if Greece does not comply or fails it should exit the Euro. In the comments the tenor was: What sort of crazy is running our Bundesbank? Does this guy know what he’s talking about? I am afraid it was me! Hahaha … France 24 chose a perfect representative of the German economics establishment. Back to the roots. We’re all moral philosophers again. Good for you standing up to the strawman argument which the German professor tried to slip so as to poison the conversation. I must say that I didn’t particularly like your first response which Philippe -a foreigner- answered a lot better. You have to allow yourself to be less technical at times . You might be tempted to ask now who the Heck is Hermes Holodides, well I had to learn that myself, not living in Germany anymore since many years. Apparently he is a TV star in a soap opera called Lindenstrasse, his german was anything but fluent and he had a great deal of trouble to bring forward some coherent points. Need I say more? Stagemanaged! On the France24 debate, you nailed it. The bottom line is so bloody simple that a 7 years will understand if it is explained appropriately. You can not lower debts by taking on more debts, applying austerity, killing economic growth, and plunder state assets to pay the debts, this is simply thievery. You have a choice, you can safe the banks or you can safe society, it is impossible to safe not both. Prof. Henkel I mentioned above, and I do not share his views by a long shot, made a very interesting comment, J.C. Trichet should consider himself lucky if he is not being dragged in front of a European court! and may be more important so, he considers it to be utterly ridiculous that Germany, as the economically strongest EU member, is trying to tell other EU countries how to behave, and yes, I think he has a point there! 1. Inherent structural differences in the EU member ship were never addressed in a intelligent way, they were deliberately neglected, because it suited certain power brokers of the system. Example: When Turkey bought 20 Tanks, Greece bought 40 and a submarine, and Germany more than happy to support Greece taking on further debts to be able to purchase them. A 0,5 billion sub is no peanuts, and arguing that the German export to Greece would be only a small % of their total export is avoiding the issue but not contradicting the facts. A fact is also that Germany is now number three in global weapons exports! Shall we connect a few dots please? Another fact is that the global weapons expenditure went up during the time frame 2007 to date, smack in the middle of this so called ‘crisis’, I prefer the term heist! World military spending has reached USD 1,6 trillion in 2010. The USA has increased its military spending by 81 per cent since 2001, and now accounts for 43 per cent of the global total, six times its nearest rival China. At 4.8 per cent of GDP, US military spending in 2010 represents the largest economic burden outside the Middle East’, states Dr Sam Perlo-Freeman, Head of the SIPRI Military Expenditure Project. Let’s put that into context, the 1,63 tln is a 1,3% increase in real terms since 2009. Doesn’t sound much does it? Your seat belts are fastened? It is a 50% increase since 2001 and now corresponds to 2,6% of global GDP. The latest deal between USA and the house of Saud adds up to a juicy USD 70 bln contract, the biggest single weapons deal in history. US military expenditure accounts for 43% of world total, of course, paid for with debts that never will be repaid, how convenient! Suggestion: Freeze global military expenditure for a duration of 10 years, use the funds to fight global hunger and lack of education instead. The underlying deep structural problems in the banking sector were never addressed. The authorities had more than 4 years to come up with a credible solution, they gave us Basel III instead. The next ECB Banker will come from Goldman Sachs, excuse me, but am I the only one who smells a rat? At the beginning of this heist, and their words will echo for eternity, politicos like Merkel, Obama and so on all joined the quire of Too-big-too-fail shall never happen again, suggestions were made to break up the banking cartel and their ‘Parasite economies’ [Roland Beneditkter-Social banking and social Finance, http://europe.stanford.edu/people/rolandbenedikter/ ] but what we have instead now is an even greater concentration of capital and power, Banks got even bigger, and let’s face it, their games never stopped, on the contrary! The trend is indisputable, and eventually points to a higher probability of and increasing international instability. Only if we start to acknowledge the links between economy, the massive geo political tectonic shifts that are happing as we speak, and our dysfunctional Lobby power infested democracies, only if we finally start to be honest about these links and acknowledge that hunger in the world is political, we can progress into a more peaceful future that is based on freedom and equality. At the moment, the political incumbents are acting in a sisyphean style manner, they changed nothing. Governments in Greece, Ireland etc. are captured forces and do not represent their people anymore. Elections have turned into a farce. Why? How can you have a useful election if all the political parties, as was the case in Ireland, as was the case in Portugal, all agree to EU/ECB/IMF austerity plans evenbefore elections takes place? Such a stitch up should not even be possible and clearly ruled out in any democratic constitution. Let me skip any comments on videos (which actually might mean something) and be slightly of the subject. I am following your arguments since the beginning of this crisis, and personally it happened to know you from your excellent book on principles of economics. Although i have one big question for you. Can you please clarify to me one point. Your were/are against any bailout OR against that / this / those specific bailout /s ? I would much appreciate this particular clarification. I was against a bailout (of both states and banks) that treats insolvency as if it were a liquidity problem. When technocrats to lose faith in their dogma, they becomes even more dangerous. If they believe an hole in a boat makes the boat go faster and it doesn’t go faster, then it is because the hole isn’t big enough. Then they panic, racing against time to get the hole bigger before it sinks. It’s completely absurd and it’s 100% German. Instead of any credible assistance, Germany has ruined our economy by focusing on punishment rather than effective cure. And since this is all about damnation, shall we say “Let the stupid by consumed by Hades”. Germany has ruined your economy? What was there to be ruined in the first place? You almost sound like someone from Singapore that finds himself in today’s Greece. The combination of having a joint currency with countries that worked on their competitiveness and not becoming competitive itself has ruined Greece. Don´t get me wrong I do not believe that additional new austerity programs will fix anything at the moment. Greece should just default, get a weak currency and restart. I am happy with this prospect? Will you, however, be happy with the mass unemployment such a move would bring to your doorstep? For if Greece leaves the euro, Ireland will be forced to join it, then the Frenchbanks will implode, followed by Spain’s debt’s explosion — before long Germaby will have returned to the Mark, which will re-value massively, thus causing your industry to lose a large chunk of your Chinese and other export markets. At that point, you will need to explain the widsom of your proposal to your unemployed countrymen and women. Good luck! How would you feel to have to pay for the mess other countries created? 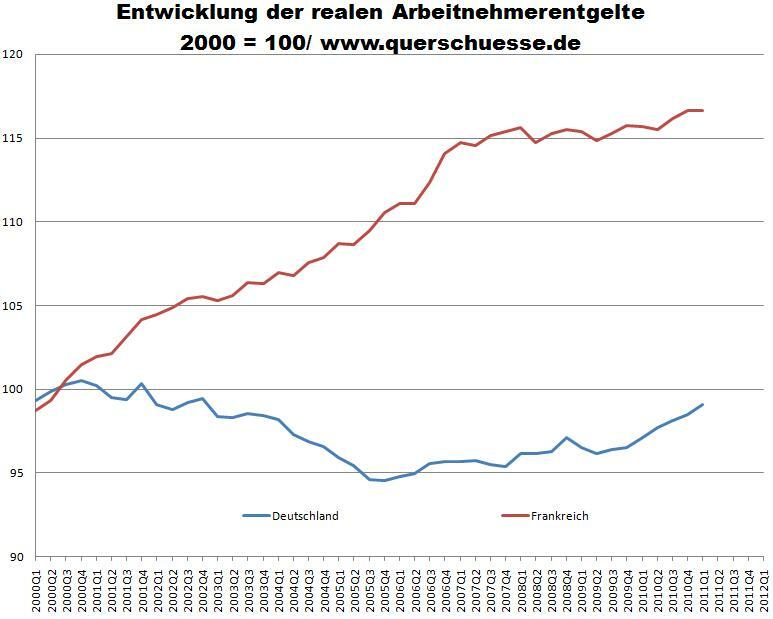 This chart shows the real wage development in Germany and France since 2010. Germany is the flat line. My personal share of debt guarantees that the German government has signed for the bailouts (IE, PT & GR) is around EUR 70.000. I calculated this based on total debt guarantee amount Germany x my taxes / total German tax revenue. Why on earth would I agree that my government supports another bailout? Frankly, I should consider to get out of Germany and move to Switzerland unless my country gets out of this Euro experiment. It is time to cut the losses. I would feel terrible Knut. But, I would also be a lot more humble if I had played a leading hand in creating the mess they are in. Which company bribed its way through all layers of Greece’s political system in order to sell its wares at exorbitant prices? (Siemens rings a bell?) How can Germany keep a straight face when demanding that it maintains trade large surpluses within the Eurozone while, at once, demanding that the rest of us have no deficits? My dear friend, Germany must come to terms with the simple fact that there is a price to pay for the significant benefits it derives from locking uncompetitive countries like Greece into its vital space by means of a common currency. In effect, Germany must understand the difference between a hegemonic position and an authoritarian denial of basic facts. Obviously you are seeking feedback on the video itself and not my personal commentary. •Julia CAGE. – She was right on the money regarding remedy needed; 100% on target. I give her an A+ and she is “Absolument Delicieuse”. •Philippe d’ARVISENET.- Excellent points , I give him an A. I liked his big picture perspective. •Yanis VAROUFAKIS. – The usual excellent. But I will you an A- because of double talking w/ Kerber. Try to avoid such in the future because it takes away from the message. •Prof. Dr. Markus C. Kerber. – Obviously I disagree and I will give him a polite B.And here is my personal reply to him: “Sir, if Greece was chosen for any sort of EU experimentation, then you have chosen the wrong people and for the wrong task”. The million dollar question is if these two blocks, i.e., the French guys and you on the one hand and the German guy from the other hand, were chosen from the journalist with the restriction of having a representative sample of the dominant thinking direction from each country. What I mean is, I am not sure (or simply I don’t know) if among the French ruling class, ideas such as Julia’s or Phillippe’s are actually having a strong position or if these two are exceptions in a valley of super-conservative and ridiculously anti-unitary sentiment. As to the German guy, some of us know that Germany, though a country that deserves our respect – great philosophy, highly sophisticated artifacts, cradle of marvelous composers and artists, etc., fights throughout its history between two “inner-worlds”, namely the world of science, innovation and rationalism and the world of catastrophe, darkness and monomania. This is probably the reason we’ve never had the “chance” to experience a truly German empire, and German language, although as I said before, the language of, e.g., Goethe, was never a lingua-franca as it was the case for Greek, Latin or English (nowadays). Personally, I am filled with agony as I am waiting to see which of these two Germanies will win this time. As you have written in the past, Germany should play the role of the prince of Europe and not the tyrant of it. In the (short) past, Germany has earnestly and conscientiously tried to becoming the dynast of both Europe and Middle East without success (or at least without a uncovered success) causing a huge disaster. I hope this time to be different. Great work on the debate! I already touched on this topic in my other comment, but i would once again like to know what is your position on the deregulation that has occured in the US and EU in the past 20 years? Economic commentators here have said that one reason Australia has not suffered is due to the stricter regulation we put on our financial institutions. Is it possible to increase regulation on these greedy evil banks, who it seems have created this entire problem to begin with?!?!?! Well i am not an economist . I am trying to keep up with cash flows cancelling each other , resulting in a all win (fair) situation . I guess i am not objective because i am greek and obviously not a banker , but i can not understand the idea of higher interest rates loans to punish a country which crossed a certain point in borrowing . Giving an example ( not the best way to give a view ) , imagine a protective mechanism installed in a car , designed to inhibit the driver (which is informed of this mechanism) from going faster than a certain speed limit , by weakening the brake system when the car crosses this certain speed limit . If there is an inhibitive logic behind that , that logic destroys itself as soon as the car goes faster than this limit and a danger appears . In case of Greece , it is clear that a protective-brake system thinking is more logical than the inhibitive approach is . Dont know if this physical analog has anything to do with economy . But i am sure that it makes sense when human lives are concerned . It is always nice to hear Mr Varoufaki supporting his view . I am sure Germans dont make Cars like this . Does this really makes sense to anyone? Where’s Monty Python when you really need them? Just to clarify, when Mr. Varoufakis says that it would be “idiotic” for germany to buy greek bonds, exactly where would the money to buy the eurobonds come from? 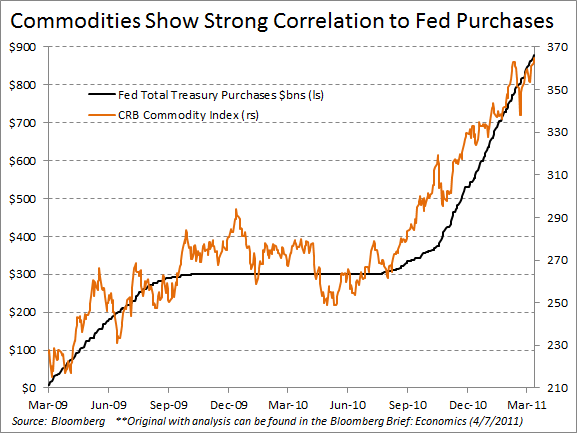 From the money markets of course! From precisely the same investors who are now forced to put all their eggs in the US Treasury Bill basket. Can ti be that comments here are no appearing if there are links in the post? I have one listed here since a few days as ‘awaiting moderation’, so I try to post without the links, except hopefully two. Comments? Yeah, I love the book shelves! You have a choice, you can safe the banks or you can safe society, it is impossible to safe both. Inherent structural differences in the EU member ship were never addressed in a intelligent way, they were deliberately neglected, because it suited certain power brokers of the system. At the beginning of this heist, and their words will echo for eternity, politicos like Merkel, Obama and so on all joined the quire of Too-big-too-fail shall never happen again, suggestions were made to break up the banking cartel and their ‘Parasite economies’ [Roland Beneditkter/Stanford -Social banking and social Finance ] but what we have instead now is an even greater concentration of capital and power, Banks got even bigger, and let’s face it, their games never stopped, on the contrary! In today’s International Herald Tribune there is an interesting article about what link between the changes in Eastern Europe around 1989 and the Arab spring of 2011. One key point was that the Internet allows for a much wider participation, but at the same time it leads also to a much greater fragmentation of information and knowledge. In the old times, a clear editorial line for the press was to distinguish facts from opinions. Today these two are often mixed and confused. Moreover, we need to distinguish between general debates and policy issues. The two can be linked but it does imply knowledge about the legislative process i.e. when something does become a law upon which everyone can and should act upon. Yet public policy carried by a cultural consensus means also a new form of self governance based on a self understanding which we are able to communicate to each other. Why start a comment like this? Not everything is a farce! But there is no analysis of both the problems and what options exist to solve them. If trade unions refuse to understand all those who worked for the Greek railway company were over paid in terms of what was the ability of the company to earn, then we have a discrepancy between demand and supply – with no one asking where should the money come from. How to bring economic sense into such an organisation when it has been the practice to just demand without asking under what conditions such money can be obtained to pay for these high salaries e.g. 8 000 Euros a month. If anything would be needed to get out of the crisis, then it is to recognize together where are the fault lines in terms of not only pay, but waste of resources. But for that you need an open accounting so that everyone knows how much each person earns, but also what services and supplies in the case of a hopsital received what amount of money for what amount. To take the question a notch higher: if defense expenditure is justified by providing security, do five more jets mean more security? Many politicians vote for things without knowing either the real costs or the quality of what is being purchased, but it does amount to doing often things on the cheap and therefore that dimishes the purchasing power. The entire society is caught in an irrational jail: while it is rational to make more money by selling, for instance, more cars, we know this quantitative increase as measure of success harms the environment, increases the pressure on the oil market and leaves our land be consumed by still more streets, parking spaces never mind new auto salons. Therefore the question of how to get out of the crisis is one of what development model do you want to appease everyone wishing to have a decent life. Obviously there are not many answers to what should be the goals of society and therefore we slip down to the usual level of economic indicators, things are fine when there is economic growth and the deficit is within a safe risk. All the rest is just public relation exercises to appease the financial market and those who get easily upset if they loose a few percentage points on their shares. For we are in a virtual world of money consumption and the more money is being consumed, the better off are those who administer only money and not people. To conceptualize a different model of development there is need to recognize real needs and act accordingly so that people feel recognized in what they can and do contribute to making life in society with others possible. There is a need to alter the success criterion: it is not just making money, and if possible, as much as possible, but what qualitative contribution to mankind begins with being just honest about one’s own needs and what one can contribute. That will do as a start. The solution is very simple and as Julia Cage said it, it’s staring us in the face. Greece needs a period (say 2-3 years) of artificially low interest rate (say 2%) available to her in rolling over its debt. It can then comfortably repay her debt and put her economy back into a sustainable growth path. To have taken such a simple case and have created such a messy example in European governance, this is an achievement in stupidity only Germany and Brussels can do. And yes, I do agree that this is a eurozone problem (although with Greek mismanagement putting the poor country at the forefront of market neuroses). You being a mathematician, surely have a feeling of what is a proper science, where you observe nature, develop models and then try to find proof and evidence for it. But how come, that high decorated professors, take pride in consulting our poloticians and influencing largely our world, in issues that affect the lives of millions of people, when they themselves obviously don’t have a sound understanding of the happenings. Wouldn’t you agree, that a crisis like this one and the controversial discussion of economists, which seem largely ideology driven – if not even interest driven – destroys the scientific claim of economy as a science at all. And if we do not have a sound understanding of the issues at stake, how can we dare to play around with the lives of millions of people? Shouldn’t we stick to what we understand for the things that are vital to our world, like a sound banking system? Dear Xenofon. For three decades now, buried inside the economic theory discipline, I have had to endure brilliant economic theorists whose professional success is predicated on NOT having anything useful to say about really existing capitalism. recently, I published a long book on this (MODERN POLITICAL ECONOMICS: Making sense of the post-2008 world, jointly with Joseph Halevi and Nicholas Theocarakis – see http://www.remote-sensing.routledge.com/books/details/9780415428880/ Come to think of it: Weren’t economists such as Professor Sinn the providers of the academic veneer necessary for all the policies, prior to 2008, that led to that debacle?